Check out our news page to see Upcoming 2018/19 Exhibitions! Cluster Tines are available in eight or ten groupings of Needle or Micro Hollow Tines. The hollow is excellent for thatch removal over‐seed preparation to about 20mm ¾” maximum depth. The needle will prick the surface to about 40mm (1 1/2”) depending on density like a vertical action sorrel roller. These disposable heads are available for attachment to the machine using a Cluster Mounting Flange available for Spigot Clamp (SC) or Draw Bolt (DB) mount. Use for very close pattern Micro Hollow Tining at medium to shallow depth to enhance surface drainage while relieving surface compaction. Very effective also for thatch removal and in preparation for over - seeding. 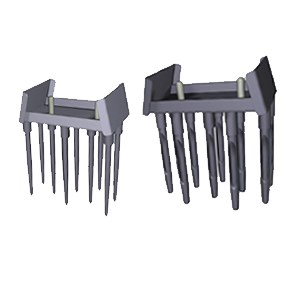 Depth Range: 1/2" - 2 1/2"
Cluster of Eight Needle Tines 5/16"
Fast ground coverage for close pattern spiking throughout the summer and just before treatments such as fertilisation to encourage deeper rooting. No surface disruption. Cluster of Eight Needle Tines 1/4"
Use for very close pattern Micro Hollow Tining at shallow depth for thatch removal and in preparation for over - seeding. Depth Range: 1/4" -1" Spike Diameter: 5/16"
Produces precision depth Needle Tining at a very close pattern for a Sorrell Roller effect for surface drainage or over - seeding. Depth Range: 1" - 2" Spike Diameter: 1/4"
Spigot Clamp - Used for mounting Cluster Heads to machines accepting the spigot-clamp type fitting (i.e. The HD Range). Draw-bolt - Used for mounting Cluster Heads to machines accepting the draw-bolt type fitting (i.e. The MD Range).